As of 17:30 on November 4, typhoon No. 12 (International name Damrey – Elephant) killed 20 people (18 people in provinces and 2 people caused by shipping incident). On November 4, typhoon No. 12 (Typhoon Damrey) landed causing huge damage to people and property in the southern central provinces. According to preliminary statistics of the Standing Office of the Central Steering Committee on Disaster Prevention and Control, to 17:30 on November 4, typhoon number 12 killed 20 people (18 people in provinces and 2 people due to shipping incident). Online news, among them, Binh Dinh 2 people, Khanh Hoa 12 dead, Lam Dong 3 people). In addition, 17 people are still missing: Binh Dinh 14 people, Phu Yen 1 person, Khanh Hoa: 2 people. Storm 12 made 531 houses collapsed completely and 23,755 houses were damaged roofs. Seven ships were sunk (VR-SB, 10 crew members), Hoa Mai 68 (cargo ships, 11 crew members), Son Long 08 (cargo ships, 12 boats Jupiter (passenger ship, 7 crew members), Ha Trung 98 (10 crew members), Nam Khanh 26 (cargo ships, 11 crew members), crew members departed, Fei Yue 9 member). A total of 76 crew members on board. 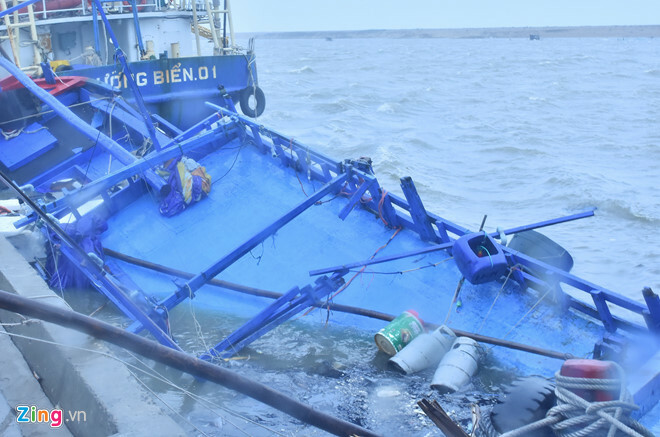 An Phu 168 boat (cargo ship, 7 crew members) have trouble, has saved seven crew members. According to preliminary reports, up to 17 hours on 4/11, two crew members were killed, 11 crew members were missing, and functional forces saved 70 crew members. In addition, Hurricane Damrey caused many roads were landslide, serious subsidence. Highway 1 runs through Phu Yen province where 5 sites are flooded half way. National Highway 1D across Binh Dinh Province has 10 positions of talc. At Deo Ca National Highway 1 in Khanh Hoa, many areas have fallen rocks, slipping, trees fall along the road. Ho Chi Minh road in Quang Nam province is completely blocked. The units have overcome and regulate traffic to ensure one-lane traffic. Talking to the newspaper VietNamNet, Mr. Le Thanh Hai, Deputy Director of the Center National Meteorology and Hydrology said the typhoon No. 12 landed in the southern central light is strong storm 4/11. “Our colleagues at the South Central Meteorological and Hydrographic Station estimate that this is the most powerful typhoon that has landed in Nha Trang so far, overcoming the historic storms of 1988, 1993 and 2009. At the gas station statue on Tran Phu street measured the wind to level 13, Hai said. Mr Hai said that on the night of November 4, the cold weather intensified, so the precipitation in central and southern central Vietnam would be very serious in the next few days, at least until 7/11. According to this position, most of the floods on alarm 3, this morning can put up the historic level. It is possible that Thua Thien Hue, Quang Nam, Quang Ngai and Binh Dinh will repeat the floods as in 1999. Meteorological authorities warned of the high risk of flash floods, mountainous landslide, riverside and deep floods in the low lying areas of the above areas.